Two local women have emergency surgery to avoid the spread of flesh-eating venom after being bitten by tiny spiders hidden in their trousers. The two women were bitten on separate occasions, in the Herault and Gard départements. Sandra, age 32 – was bitten by a spider hidden in the leg of her trousers, as she pulled them on while getting ready for work. The bite mark, at the top of her leg, immediately turned red and blue and began to spread. The same thing happened a week earlier in Montpellier, where another a young woman in the process getting dressed was bitten by a spider hidden also inside the leg of her trousers. According to surgeon Christian Herlin, she was left with a 10cm scar after being operated on. The culprit is the brown recluse spider, also known as the fiddleback; a species native to North America but whichhas been recorded in France over the last 15 years. It measures only a centimetre and a half, but its bite packs a punch, with venom that causes necrosis, or cell death, of the skin tissue. After a bite a surgeon must remove the damaged tissue to prevent this spreading. 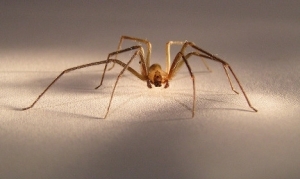 A quick look at Google Images under the search term "brown recluse spiders bite" leaves you in no doubt how bad things can get if you are unfortunate enough to be bitten.